Avinguda Diagonal façade of Palau Robert. Palau Robert (Catalan pronunciation: [pəˈlaw ruˈβɛɾt]) is a building on Barcelona's Passeig de Gràcia 107, the former private residence of Robert Robert i Surís, an influential aristocrat, politician and businessman at the turn of the 20th century. It's now a government-run institution that hosts an exhibition centre with three halls, a concert hall, and gardens as well as the Information Centre for Catalonia, including the city's tourism bureau. In the 1936-1939 period, it was the site of the Generalitat de Catalunya's Ministry of Culture. After the Spanish Civil War, Robert's family regained the Palau, until its second purchase by the Generalitat de Catalunya (the Catalan government) in 1981, when it became a public building. An example of late neoclassical style, made of stone from Montgrí, the Palau Robert was finished in 1903 under the direction of architects Henry Grandpierre and Joan Martorell i Montells. The garden was designed by Ramon Oliva, who also designed Plaça Catalunya. Its palm trees were brought during the 1888 Barcelona Universal Exposition. The nearest Barcelona Metro station is Diagonal, and the FGC station Provença, on lines L3, L5, L6, L7, S1, S2, S5 and S55. The station's exit is adjacent to the Palau Robert. Bus lines stopping nearby are: 6, 7, 15, 16, 17, 22, 24, 28, 33 and 34. Wikimedia Commons has media related to Palau Robert. La Barceloneta is a neighborhood in the Ciutat Vella district of Barcelona, Spain. The neighborhood was constructed during the 18th century for the residents of the Ribera neighborhood who had been displaced by the construction of the Ciutadella of Barcelona. The neighborhood is roughly triangular, bordered by the Mediterranean Sea, the Moll dEspanya of Port Vell, and this neighborhood even has its own flag. The neighborhood is serviced by its own stop on the Barcelona Metro and this is a good starting point for whatever itinerary there may be to adventure through La Barceloneta. The yellow line, L4, which is the line that stops at La Barceloneta, is the most popular for pickpocketing. The neighborhood can be discovered by taking Las Gorondrinas, which leave from the front port of the Columbus monument and this way the marine strip can be discovered, but the real charm of this neighborhood is by getting lost in the side streets or alleyways. Torre Sant Sebastià is the terminus of the Port Vell Aerial Tramway, opened in 1931, La Barceloneta is known for its sandy beach and its many restaurants and nightclubs along the boardwalk. Over the past several years the quality of the sand on the beach has become a source of continued controversy, in February 2008, the World Health Organisation began an inquiry designed to ascertain whether the sand meets WHO beach health and safety guidelines. With its modernity, La Barceloneta continues to inhabit the scent of salt, for many, this is considered a luxury. 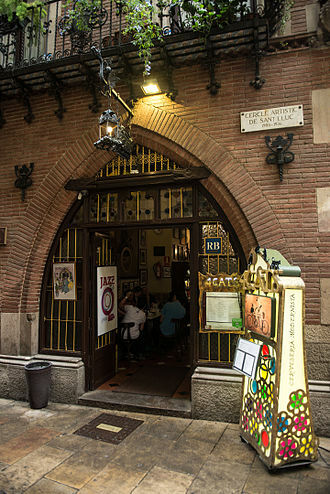 La Barceloneta attracts many cruise ships to dock, in the center of the neighborhood, there is a small museum, called Casa de la Barceloneta, which is housed in a preserved building dating back to 1761. Admission to the museum serves as an insight into the evolution of the neighborhood, the house has a stone façade with letters and number engraved that are inscriptions of the plots used in construction. La Barceloneta was practically an uninhabited zone until the mid 18th century, fishermen were the first to frequent this part of Barcelona even though the sea conditions were very precarious. In 1754, construction of the first houses began, and the neighborhood began to become filled with residents who took part in activities of the port, the neighborhood of La Barceloneta was designed by an engineer named Juan Martín Cermeño. 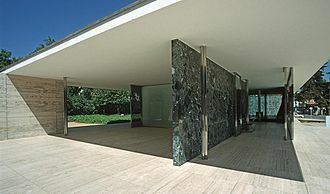 The Barcelona Pavilion, designed by Ludwig Mies van der Rohe, was the German Pavilion for the 1929 International Exposition in Barcelona, Spain. This building was used for the opening of the German section of the exhibition. It is an important building in the history of architecture, known for its simple form and its spectacular use of extravagant materials, such as marble, red onyx. The same features of minimalism and spectacular can be applied to the prestigious furniture specifically designed for the building, among which the iconic Barcelona chair and it has inspired many important modernist buildings, including Michael Mansers Capel Manor House in Kent. Mies was offered the commission of building in 1928 after his successful administration of the 1927 Werkbund exhibition in Stuttgart. However, Mies had severe time constraints—he had to design the Barcelona Pavilion in less than a year—and was dealing with economic conditions. In the years following World War I, Germany started to turn around, the economy started to recover after the 1924 Dawes Plan. The Commissioner, Georg von Schnitzler said it should give voice to the spirit of a new era and this concept was carried out with the realization of the Free plan and the Floating roof. Miess response to the proposal by von Schnitzler was radical, the pavilion was to be bare, with no exhibits, leaving only the structure accompanying a single sculpture and specially-designed furniture. This lack of accommodation enabled Mies to treat the Pavilion as a continuous space, the design was predicated on an absolute distinction between structure and enclosure—a regular grid of cruciform steel columns interspersed by freely spaced planes. However, the structure was more of a style, some of these planes acted as supports. The floor plan is very simple, the entire building rests on a plinth of travertine. A southern U-shaped enclosure, of travertine, helps form a service annex, the floor slabs of the pavilion project out and over the pool—once again connecting inside and out. Another U-shaped wall on the side of the site forms a smaller water basin. Bellesguard, known as Casa Figueres, is a modernist manor house designed by Catalan architect Antoni Gaudí, which was constructed between 1900 and 1909. 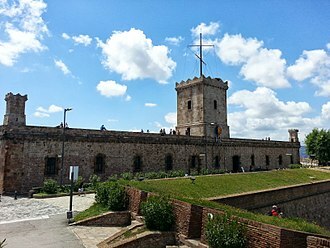 It is located at the Sarrià-Sant Gervasi district of Barcelona in Catalonia, the ground on which Bellesguard stands on had been the site of a country residence belonging to Martin, king of Aragon and count of Barcelona. Gaudí was assisted by Joan Rubio whilst Domènec Sugrañes i Gras created the mosaics that adorn the house. Gaudí drew inspiration for Casa Figueras from the castle that once stood on the same site. When King Aragon died without an heir in 1410, his widow, Margaret of Prades, following her death, the castle fell into decline and was passed from hand to hand over centuries until Jaume Figueres purchased the estate in 1900. When Jaume Figueres and his wife María Sagues Molíns commissioned Gaudí for the project in 1900, all that remained of the structure were a few walls. As always, Gaudí sought to blend the construction with its natural surroundings, Gaudí designed the home in a period where he himself was still developing his unique style. Gaudí was given free rein to design and construct what was intended as a home for the Jaume family. The house changed hands for years until the Guilera family purchased the home in 1944 and has continued to own it for over 70 years. The building continued to serve medical purposes following Lluis’ death in 1969 when his son, Lluís Guilera Soler, several Barcelona citizens were born in Casa Figueres until 1974 when the site of the hospital relocated to a more accessible area better suited to medical needs. From that point on, the building has served the purpose that Gaudí always intended—a private home. For the past 30 years, the Guilera family has left the gates open permitting guests to stroll the gardens, over the years, they received countless requests from visitors to explore inside the home and enjoy Gaudí’s more modernist interior detailing. Both due to the demand from visitors as well as the family’s realization that restoration was necessary. The family officially began inviting tours in September 2013, offering access to the interior accompanied by explanations of the history, Casa Figueres is constructed mainly of stone and brick. Casa Vicens is a modernist building in Barcelona, designed by Antoni Gaudí. It is located in the neighborhood of Gràcia on Carrer de les Carolines,24 and it is considered one of the first buildings of Art Nouveau and was the first house designed by Gaudí. It helps explain the character of his work and a new chapter in the history of modern architecture, the style of Casa Vicens is a reflection of Neo-Mudéjar architecture, one of the popular styles that can be seen throughout Gaudís architecture, including oriental and neoclassical as well. The Casa Vicens was commissioned in 1877 by Manuel Vicens i Montaner and he inherited this section of land from his mother on August 29,1877, and hired architect Antoni Gaudí for the project. 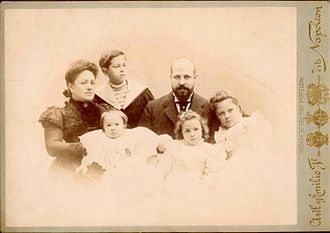 Manuel died on April 29,1895, the house was enlarged in 1925 by Joan Sierra de Martínez. This early work exhibits several influences, most notably the Moorish influence, Casa Vicens marks the first time Gaudí utilized an orientalist style, mixing together Hispano-Arabic inspiration. This was a style of architecture that completely breaks with the norm of the period, not only does this house mark Gaudís coming of age, being his first major work of architecture, but it represents the flowering of Catalan modern architecture. The plans for construction date back to January 15,1883, Gaudí was granted a construction permit on March 8 of the same year. This is recorded in the files of Las Corts de Sarriá, the house is constructed of undressed stone, rough red bricks, and colored ceramic tiles in both checkerboard and floral patterns. At the time of construction, Gaudí was just beginning his career. Gaudí graduated from the Provincial School of Architecture in Barcelona in 1878, some characteristics of this style include the juxtaposition of geometric masses, the use of ceramic tiles and abstract brick ornamentation. In 1899, Casa Vicens was acquired by Dr. Antonio Jover, in 1924, Jover moved into the house. Before that, it had only used as a holiday home. During the time of his ownership the house was a building and was not open to the public. The Ancient Synagogue of Barcelona is believed to be an ancient synagogue located in the centre of Barcelona, Spain. It has been described as one of the oldest synagogues in Europe, after many centuries of use for other purposes, the building re-opened as a synagogue and museum in 2002. No congregation prays regularly at the Sinagoga Major, but it is used for festive occasions, archaeological investigations show that the original structure of the building was built in the third or fourth century, whether this structure was the synagogue cannot be said with certainty. The building was expanded during the 13th century. Medieval Barcelona is known to have had several synagogues, and the synagogue was certainly in the immediate area. King James I visited the synagogue in 1263 at the conclusion of the Barcelona Disputation, shlomo ben Aderet served as the rabbi of the Sinagoga Major for 50 years. The Jews of Barcelona were massacred in 1391, the building was used for many purposes and its original use was forgotten. Over the centuries, additional stories were added to the building, in 1987, Jaume Riera y Sans began researching the location of the Sinagoga Major. 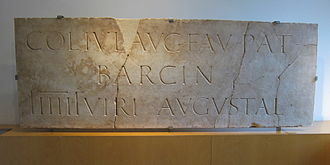 His research was based on a reconstruction of the route followed by a tax collector that ended at the Sinagoga Major. Rieras work led Miguel Iaffa to examine the exterior of the building, Iaffa noted that the structure had been built in compliance with religious requirements that the building should face Jerusalem and that it should have two windows. In fact, the orientation of the building broke with the northwest/southeast alignment of the streets in its neighborhood. 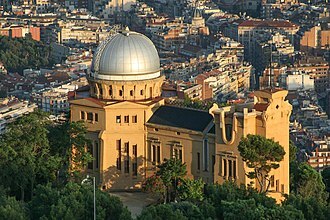 Iaffa purchased the building in 1995 when its owner put it up for sale, the Call Association of Barcelona, led by Iaffa, undertook the recovery and restoration of the synagogue. The Sinagoga Major was opened to the public in 2002, in 2003, two Canadians became the first couple to be married at the Sinagoga Major in more than 600 years. A New York attorney donated a 500-year-old sefer Torah to the synagogue in 2006, in January 2009, a right-wing extremist affiliated with the Republican Social Movement attacked the Sinagoga Major. Avinguda Diagonal is the name of one of Barcelonas broadest and most important avenues. It cuts the city in two, diagonally from west to east, hence the name, both would meet at Plaça de les Glòries Catalanes, which Cerdà envisioned as the new city centre. Avinguda Diagonal remains to this day a much-transited avenue and many companies and hotels use it as a privileged location, the avenue starts in the Les Corts district on the western edge of the city and runs to the Sant Martí district on the eastern edge. To its west, it connects with the Lleida-Madrid highway and Ronda de Dalt in the municipality of Esplugues de Llobregat. To its east, it meets the Ronda del Litoral on the border with the municipality of Sant Adrià de Besòs and it is consistently 50 metres wide and about 11 kilometres long. The different regimes that held power in Catalonia and Spain during the 20th century sought to change the street names. It has been known under the names, Gran Via Diagonal – original name which Ildefons Cerdà. Avinguda de la Nacionalitat Catalana –1922, during Miguel Primo de Riveras dictatorship, named after King Alfonso XIII. Avinguda del Catorze dAbril –1931, Gran Vía Diagonal –1939, provisional name imposed the day after the Fascist capture of Barcelona as an attempt to eliminate references to the Republic. Avenida del Generalísimo Francisco Franco –1939, during the authoritarian regime of Francisco Franco. Avinguda Diagonal – Its current name, adopted following the restoration of democracy in 1979, however, it should be noted that the name Diagonal has always prevailed in popular usage. Ildefons Cerdàs so-called Pla Cerdà was not totally successful in transforming Barcelonas urban reality, the city council of Barcelona had previously requested the approval of Antoni Rovira i Triass alternative project instead, which had been rejected. Francesc Cambó, leader of Lliga Regionalista proposed the construction of a new palace for the monarch Alfonso XIII in 1919, Avinguda Diagonal suffered several attacks by the Basque separatist organisation ETA in 2000. This V-shaped line is the result of the junction of two related lines, the original L3 and L3B, in 1982. The central section of L3 has the citys oldest metro stations, built in the mid-1920s, all of L3 stations are underground. 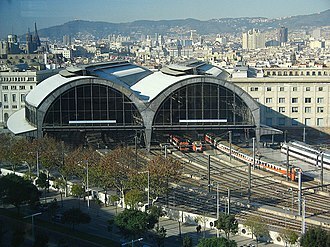 Its termini as of 2008 are Zona Universitària, which serves the University of Barcelona campus located in the western end Avinguda Diagonal in the Les Corts district, and Trinitat Nova in Nou Barris. There are plans for it to be extended from Trinitat Nova to Trinitat Vella, for connection with Line 1, and possibly south of Zona Universitària. It was operated by now defunct Compañía del Gran Metro de Barcelona, a section of the original L3 disappeared as plans to extend it in that direction would have required too much effort and the construction of L4 provided coverage for the line. These former stations of L3 remain unused,1926 - Passeig de Gràcia-Jaume I section opened. 1934 - Jaume I-Correos section opened,1972 - Passeig de Gràcia-Correos section closed. 1975 - Paral·lel-Zona Universitària section opened,1982 - L3B integrated into L3. CTE pavilion at the expo, designed by Antoni Gaudí. FGC train (111 series) in Barcelona. Historic Brill interurban carriage of Ferrocarrils de Catalunya. Some of these trains were sold to Hershey Electric Railway in Cuba in the 1990s, where they still remain in service today. A 112 Series train at Sant Quirze station. Current FGC plate at the Sabadell-Rambla station. This station will be replaced with the construction of further stations in the town. Carrer Marlet, in the old Jewish quarter of Barcelona. The Sinagoga Major is on the left. 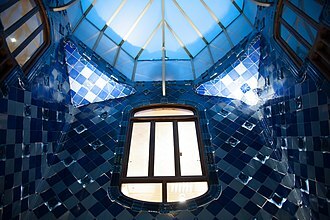 The atrium; Gaudí convinced Batlló to let him expand the central well of the building to let in light, instead of rebuilding. Casa Bonaventura Ferrer Architect Pere Falqués. Main Floor Saloon by Gaspar Homar, conserved at Museu Nacional d'Art de Catalunya. A fragment from first drafts of the architectural plans from 1906, showing the sculptures mounted on the upper facade. Landscape in the Montgrí Massif, with the Valley of Santa Caterina and the rocky Puig Rodó. The Puig Rodó in the Montgrí Massif.